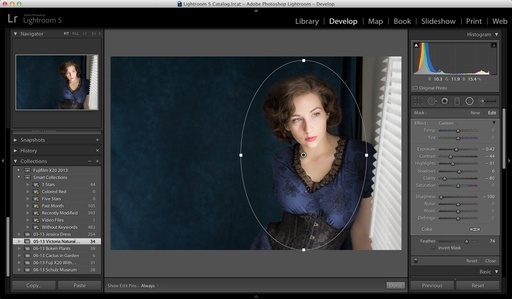 Lightroom 5 has its share of headliner features as well as small improvements. In my Macworld Magazine article, Adobe Photoshop Lightroom 5 presents an impressive and innovative upgrade, I cover the biggies, such as Smart Previews and Upright, as well as my favorite refinements. My most-liked headliners are: Upright (to help straighten buildings and horizons), Radial Gradient (to draw attention to a specific area of the image), and Smart Previews (lossy DNGs that allow you to work offline with the masters at home). As for refinements, I'm thrilled that Adobe finally incorporated a true full screen view of an image (hit the F key). As for cons, the Slideshow module continues to lag behind the competition. This surprises me considering that Adobe knows how to make great video editing software. And I think that the Library module needs some attention. Lightroom's photo organization isn't nearly as robust as its image editing ability. 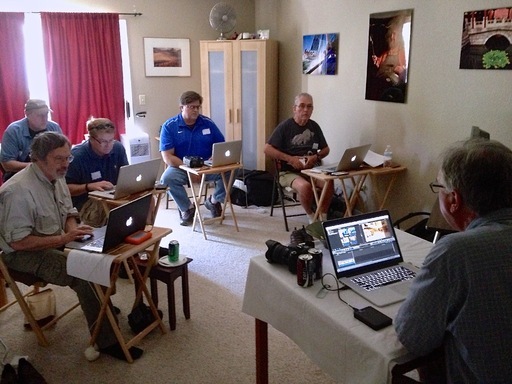 Overall, Lightroom 5 is an excellent upgrade for current Lightroom users. Its lens correction abilities and gradient tools are particularly attractive. When Yahoo! 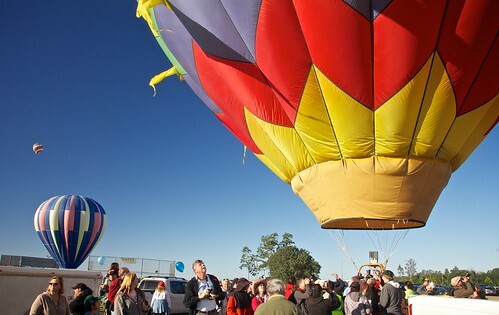 released Flickr v2 for iOS, iPhone users had a more appealing experience than their Android counterparts. In late May, that discrepancy was diminished... for the most part. 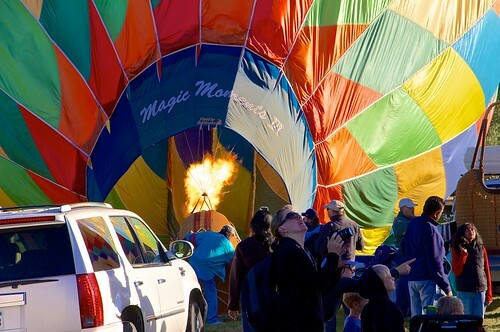 Flickr for Android brings the visual beauty of the iOS version with much, but not all, of its functionality. Since I'm primarily an iOS user, I couldn't tell if the unevenness was my lack of understanding or Flickr's UI. According to others, such as PCMag.com, it's not me; it's the app. But those few rough spots could be easily ironed out in future updates. And the app itself is beautiful. 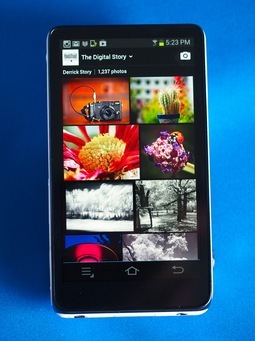 Like the iOS version, it has reenergized my enthusiasm for mobile Flickr when using Android. If you haven't done so already, give the new Flickr for Android a try. And while you're at it, join the Digital Story Public Group. We have a talented community there. And selected images from that public group are featured on the TDS Facebook page as the TDS Member Photo of the Day. 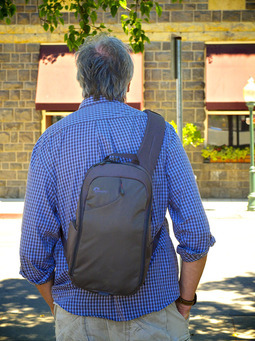 When I'm working in an urban environment, I want to travel light, have fast access to my equipment, and carry a bag that doesn't scream "camera gear." Lately I've been packing my OM-D kit in the Lowepro Transit Sling 250 AW ($99) and feeling great, even during extended shoots. The Transit sling has fast side-access allowing me to keep the Olympus OM-D tucked away when on the move, then able to grab it quickly when a shot presents itself. 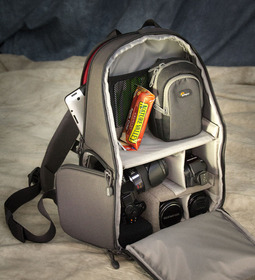 I have plenty of room for spare lenses, flash, an extra body, and snacks. There's a dedicated iPad pocket in the back that fits a 10" tablet or iPad mini. If I need a light tripod or monopod, I can use the tuck-away holder on the side of the bag. And just as importantly, I feel like I blend into the environment when working out of the Transit Sling. I used the Olympus OM-D E-M5 with the excellent Panasonic Lumix G X Vario 12-35mm/F2.8 lens to create this portrait of Alyssa in the downtown area of Santa Rosa, CA. With the ISO set to 400, I shot at f/2.8 at 1/800th in Aperture Priority mode, exposure compensation set to -1.3. The focal length was set to 35mm. I then processed the image in Aperture 3.4. Inside the Transit Sling I pack the OM-D with grip, Panasonic 12-35mm f/2.8 zoom, Olympus 75mm f/1.8 prime, and the Leica 25mm f/1.4 lens. Also stowed is an Olympus flash, Fujifilm X20 compact camera, filters, cable release, iPad (in the dedicated back pocket) and a snack. In the field, I can upload images directly from the camera to the iPad using a Toshiba FlashAir or Eye-Fi Mobi wireless card. Regardless if I'm working on location, or processing images on the iPad in a coffee shop, the Tranist Sling 250 protects my gear and doesn't get in the way. I give it a very high nimbleosity rating. Great minds thinks alike. In this case it's Canon and DP Review. 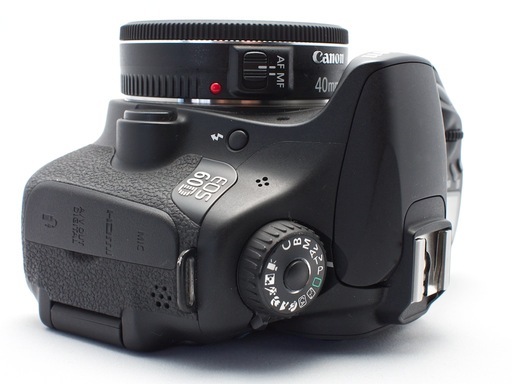 But I like the Canon EF 40mm f/2.8 STM lens too. And DP Review just honored it with Gold Award. In their review, they write: The EF 40mm f/2.8 STM is a fairly unprepossessing little lens, and its tiny size and relatively low price might make you wonder whether significant compromises have been made in its design and construction. But the moment you start shooting with it and looking at the images it produces, any such thoughts rapidly disappear - it's actually a very fine lens. And I couldn't agree more. When I'm feeling creative and want to just have fun shooting, the 40mm is one of those lenses I reach for. And for $149, how can you go wrong? The new Eye-Fi Mobi 16GB SDHC Wireless Memory Card does what I've always wanted an Eye-Fi card to do: easily connect my iOS device to my camera regardless of my location. 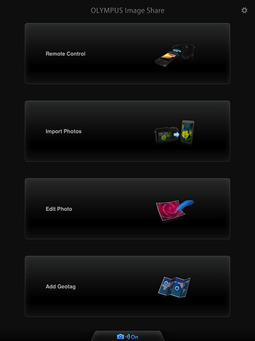 Once the card and camera are connected, the images flow from the camera to the iOS device, such as an iPad, where you can edit and share the pictures. The process is relatively simple. Insert the card in the camera and power up. Download the mobile app at www.eye.fi/mobi and enter the activation code that comes with the card. Take a picture with your camera to force the card to begin broadcasting. Open the Settings app on the iPad, tap on WiFi, and choose the Eye-Fi card that's in the list of networks. Return to the Eye-Fi app and watch the picture being transferred from your camera to the iPad. In the Eye-Fi app, you can monitor the connection via the status button in the upper left corner. When it's green, the two devices are talking. When it's red, the Eye-Fi card has timed out and stopped broadcasting. This is where the system could use a little refinement. 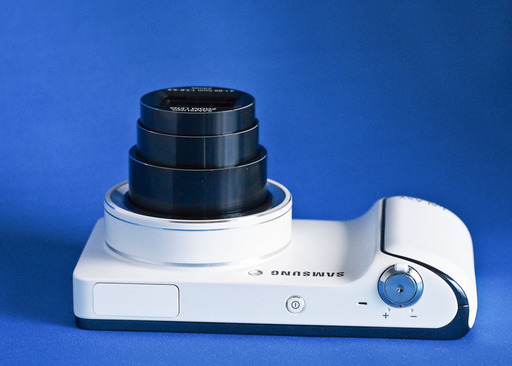 There's no control over how quickly the Eye-Fi card powers down in the camera. As it works out, it's just a couple of minutes. I understand why it does this, to save battery power. But once the card powers down, you have to prod it again to transmit, then go back to Settings on the iPad and log back in to the network. I would like to have some control over the time period before the card powers down. I found myself having to log in to the card repeatedly, even during a single session of shooting. Once the images are on the iPad, Eye-Fi creates a Photos Album to manage them. This is very convenient. You can access the Album via the Photos app, iPhoto app, or any other app that can read Albums. I also liked that transfer was swift. My medium-sized Jpegs loaded quickly and were virtually ready for use immediately after capture. You can set up sharing to Facebook, Twitter, or via email within the Eye-Fi app itself. But since the images are automatically saved to your Camera Roll, you have access to them for publishing using your normal workflow. You can add multiple Eye-Fi Mobi cards to the app, and switch among them as needed. This allows you to have cards in all of your cameras if you wish. 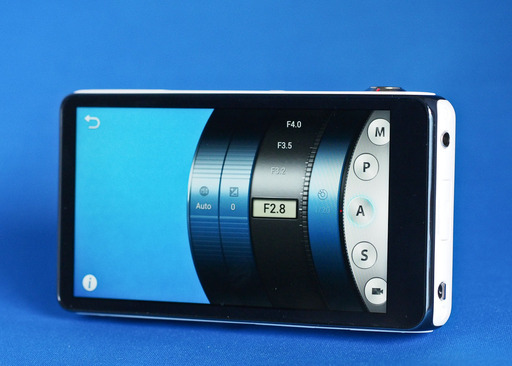 This week on The Digital Story: Samsung Galaxy Camera, Eye-Fi Mobi, and the Olympus 75mm f/1.8 lens. All of this and more on The Digital Story podcast. Story #1 - Samsung GC110 Galaxy Digital Camera - I've been testing this Android-based (4.1 Jellybean) 16MP camera with 21X optical zoom with 23mm on the wide end. 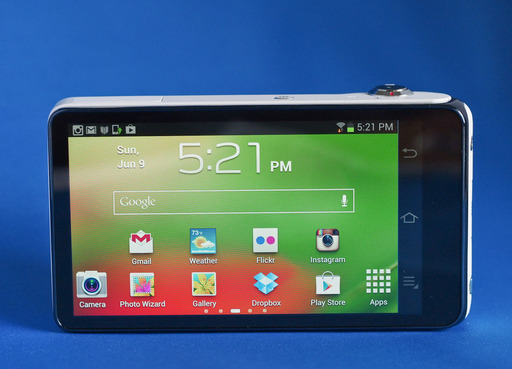 The Samsung Galaxy also sports a 1.4 GHz quad core processor, giant 4.8" LCD, and WiFi (no cellular with the GC110 model). It's selling on Amazon for $449. That's an investment for a compact camera that's on the large size. So what do you get for your money? I'll go into some detail about that. 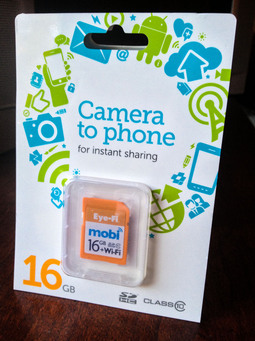 Story #2 - The Eye-Fi Mobi 16GB SDHC Class 10 Wireless Memory Card addresses one of my biggest complaints about Eye-Fi cards, lack of easy direct connect. With the Mobi, and the iOS app for my iPad mini, I can shoot with any SD card compatible camera and have the images stream to the iPad. 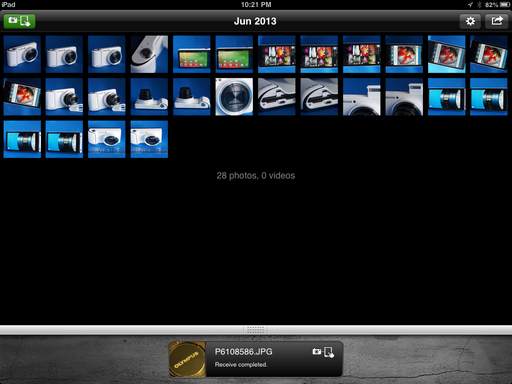 The Mobi has some nice features that help with energy management and picture organization. The 16 GB SDHC model (class 10) is currently selling on Amazon for $75. I think it's worth it. And I'll discuss why in the second story. Story #3 - The Olympus 75mm f1.8 Lens is now available in black. Yaay! I've been shooting with this beauty for a week now, and I have first impressions to share.